Destiny 2 - Which Brand Promotion Would Have Been More Fitting For The Audience? When you are the publisher for what is said to be the most expensive game of all time, it is a prudent strategy to look for additional revenue streams beyond direct sales. Over the last month Activision has sought to bolster the revenue and visibility of their flagship release Destiny 2 (the sequel to said most expensive game of all time), with two high-profile cross-promotions within the FMCG market. 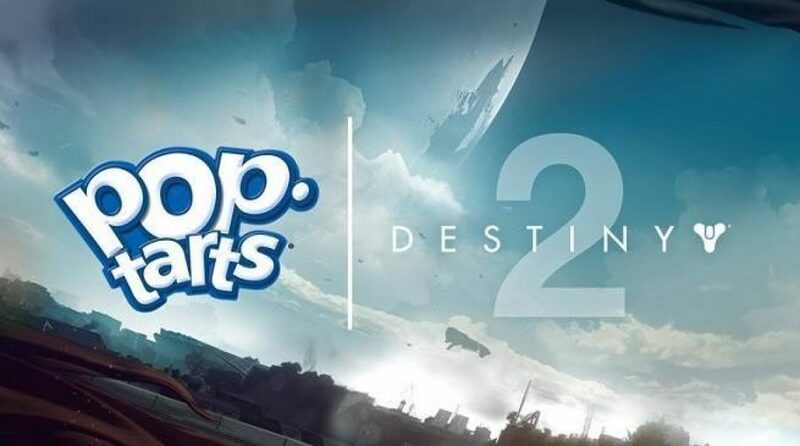 The promotion consists of both Rockstar Energy Drinks and Kellogg’s Pop Tarts offering in-game XP boosts and exclusive in-game items/skins for Destiny 2. The former of these link-ups is a logical tie-in for the world of video games where gamers often consume energy drinks to keep their wits about them during long gaming sessions – something that Destiny 2 offers in abundance. However, it is far more difficult to ascertain the congruity of the link between a huge online ‘triple A’ sci-fi game and Kellogg’s famous breakfast snack and both the gaming press and community have been quick to point this tenuous connection out. 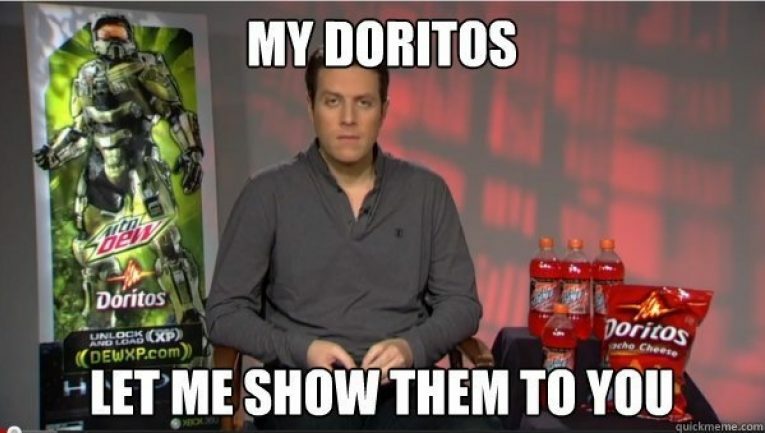 Although the response to the Destiny 2 cross-promotion was not as high-profile as the infamous Doritosgate that marred the release of Halo 4 in 2012, it is reminiscent of it. The promotion has certainly caused some eye rolling among games journalists who picked apart the seemingly tone-deaf commerciality of the promotion. Such negative sentiment is an oily rag for the incendiary nature of the gaming audience who are known for their high sensitivity and knee-jerk reactions. This means precise targeting of the gamer audience’s interests and concerns is essential when engaging in cross-promotion for a major video game release like Destiny 2. It has been standard practice in promoting a fantastical blockbuster movie by utilising cross-promotions with various FMCG avenues and ostensibly using the packaging as mini-billboards for decades. Dry breakfast food goods offer some of the best visibility available for this approach thanks to the size of the packaging and the longevity of the product both on retail and household shelves. So, why has Activision adopting the same marketing strategy caused disconcertion within the gaming world when movies of a similar media stature get a pass? Firstly, movie cross-promotions very rarely affect the actual viewing experience of the media itself, whereas Activision’s decision to offer XP boosts and potentially beneficial in-game items to players who engage in the promotion does affect the in-game experience. This has been construed as “pay to win” by many gamers; a practice which is frowned upon in full priced retail game like Destiny 2. And it these in-games incentives that cause the other differential between movie and games marketing: movie promotions on cereal boxes don’t enter the news cycle, but the same cannot be said when video games adopt the same method. Establishing an appropriate link in video games cross-promotions is vital for effective messaging with the game’s audience. Using our Constellation tool to analyse Destiny’s social media audience across two key age groups, we identified that there are several other brand categories which were more relevant to them. 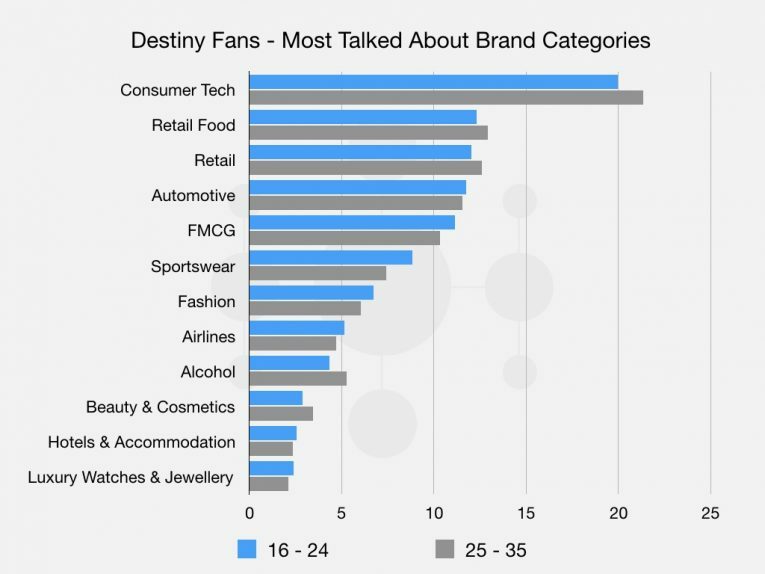 While Consumer Tech is an obvious area for the interests of a gaming audience, what would be less apparent without our data is that the next most prominent interest is Retail Food for both age groups with a higher level of interest than FMCG/CPG products where Activision have focused their Destiny 2 promotion. Retail Food is an area of commerce where a game like Destiny 2 can easily integrate an effective cross-promotion. The vast open worlds and a colossal amount of activities in Destiny 2 demand long gaming sessions – especially in the cases of Destiny’s famous Raids and the highly competitive Trials of Osiris/The Nine. Both of those particular activities can take anywhere from 3 to 6 hours to complete, more than enough time for a hardened Guardian to work up a considerable appetite and require hassle-free sustenance. Many Retail Food can provide fast food delivery which offers the ideal solution to keeping players fed without having to leave their Fireteam. That many Retail Food services also offer free delivery is something we have also determined greatly increases the Destiny audience likelihood of buying a product as we can see from the survey data conducted on the Destiny audience by GlobalWebIndex.net. This demonstrates that a cross-promotion focused on Retail Food would be significantly more concordant with Destiny’s audience and with the two other most prominent features being “Coupons and discounts” and “Loyalty points”, building a cross-promotion campaign based around these aspects could be easily applied to the Destiny experience. For instance, a player could complete a certain task/challenge within the game, particularly within a Raid or the Trials, and then receive a special discount code for a food delivery service. By adopting something akin to the strategy above, the promotion would engage in an area where the audience has demonstrated a clear interest and the features such as discounts have been proven to increase their likelihood of buying a product. Likewise, it would feel appropriate and considerate of the player’s experience; something that Pop Tarts simply does not offer. 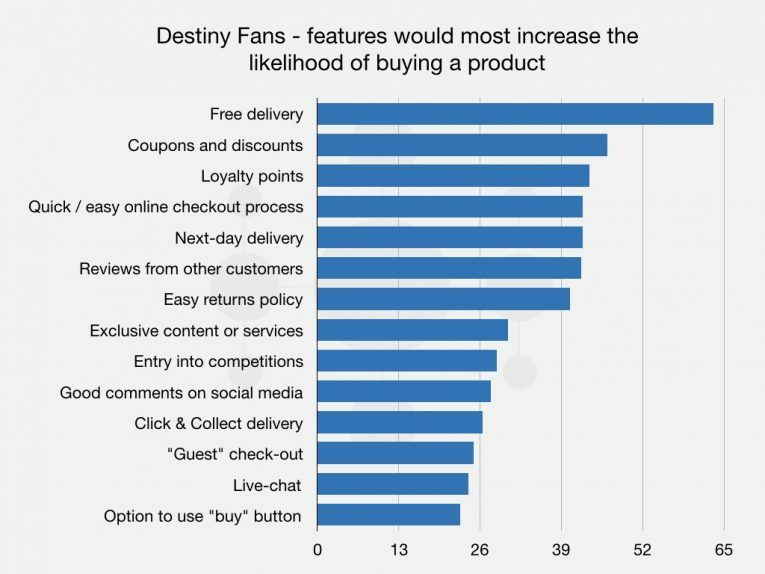 We can see from the above data that the Destiny audience is more likely to be interested in brands that “Provide innovative new products” and “Improve your knowledge and skills”. The former is a given for what is an overwhelmingly tech-savvy audience, but the latter requirement offers more traction to incentivise the audience in brand discovery. Destiny offers a vast online open world experience where knowledge and skills are key to getting the most from the experience. In a way, Activision’s decision to offer extra XP-points and in-game items from Pop Tarts purchases does offer something similar, but these aspects are so easily earned in-game, the value of these incentives is likely very low to the audience and it’s unlikely (and ill-advised) that the game’s precious Exotic gear will be awarded by this promotion. A product offering some form of guide or “hints & tips” to help a Destiny player improve their abilities and in-game experience would likely present more value to the audience, such as access to exclusive online video tutorials or including a map of the game’s huge open areas with key locations marked. Another aspect in terms of offering knowledge to the Destiny audience is to delve into the game’s lore. One of the most criticised areas of the original Destiny was the poor delivery of the main plot and the lack of in-game education on the game’s mythology (this was outsourced to the much derided “Grimoire” system). For instance - a promotion that offered a graphic novel relating to the events of Destiny 2 would be a huge incentive to die-hard Destiny fans and it could be attained by saving coupons from product purchases. Ultimately, the best promotional campaigns are those which not only engage and incentivise the target audience but one that respects them as well.